Page 38 of Walter Romig's Michigan Place Names says: "Azalia, Monroe County: Stephen B. Frink became the first postmaster of East Milan (named from its location in Milan Township) on Aug. 4, 1869. Sayre Reeves and his son William operated the Star Bending Company in Azalia. Azalia was also known as Reeves Station or Reeve's Corners. Sayre Reeves and his wife Betsy Young Reeves were both born in 1807 in New York. They had 10 children. The first ones were born in New York; then some were born in Dexter, Michigan; and the youngest ones were born in Oakville, Michigan, just east of Milan. Some of Sayre's children married Azalia residents, so Sayre moved to Azalia and had a home in the center of the community. He died in 1877. Sayre Reeves led an exciting life: while living in Dexter, he got into a dispute with the local flour mill. This culminated in Reeves aiming his pistol at Deforest Phelps, age 23. Reeves shot and killed the young farmer on May 2, 1845 alongside the mill dam. On Sept. 1, 1887, the post office was renamed Azalia. Some people say the Ann Arbor Railroad named the station "Azalia" after a conductor's daughter, but that is not true. No railroad official had a daughter or wife by that name. But it makes a fun story! Azalia is located southeast of Milan in Milan Township. Lumberman John C. Cone became the first postmaster of West Milan (named from its location in Milan Township) on Aug. 4, 1869; in 1880, the Wabash Railroad opened a station here calling it Cone and on Jan. 27, 1882, the name of the post office was changed to correspond [Buckley; Wing; PO Archives]." How did Cone really get its name? In the early 1830's, Erastus S. Cone bought farmland in the southwest part of Milan Township. That area became known as "West Milan" at the time. He had six children, including John C. Cone, who later became postmaster of West Milan. Erastus and his wife were divorced. Then Erastus married again, and had 11 more children by his second wife. The railroad undoubtedly named its West Milan station "Cone" because so many people living in the area had that last name by birth or marriage. Cone is located south of Milan on Cone Road, west of US-23. There is little left today of the former community. "Henry Post became the first postmaster of this rural post office on Dec. 22, 1832; London township was organized in 1833 in the home of Abraham Hayck, with Cyrus Evertt as supervisor from then until 1837; its post office operated until Feb. 15, 1905 [Wing; PO Archives]." London is located at Plank Rd. and Ostrander Rd., southeast of Milan. By Warren Hale, in about 1976, when he was President of the Milan Area Historical Society. Our first settler, John Marvin, arrived in the spring of 1831. He built a combination log cabin, housing both his living quarters and a general store to supply travelers and homesteaders. The cabin was located on the site of our present W. Main St. Municipal Parking Lot. His arrival was closely followed the same year by farmers Bethuel Hack and Harmon Allen. These three men and their families formed the nucleus for the present-day Milan. There was no thought or intent on the part of these men to establish a town and thus, no townsite plan was drawn or filed. Houses were built along Indian paths and wagon trails and the village simply "happened." By the spring of 1833, enough settlers had arrived to justify the establishment of a post office. The United States Postmaster General appointed Bethuel Hack as our first postmaster on March 27, 1833. The post office was designated as FARMERSVILLE because we were primarily an agricultural settlement. Local flour mill operator, David A. Woodard, became our second postmaster on May 7, 1834 and promptly re-named the town WOODARD MILLS in honor of himself and also to get free advertising for his business. His mill continues to serve local residents as our Community House. Sometime in the interim between 1834 and 1836, Henry Tolan, our village's first druggist, served as postmaster in an acting capacity and in an apparent fit of egotism, again changed the name of the post office to TOLANVILLE. He operated the post office from his small drug store located on the corner of Main and Tolan Streets, the site of our present Western Auto Store. Meanwhile, during the first five years of our existence, some individualists in our midst chose to retain the Township name of Milan as a suitable name for our new town as it was located primarily in that Township, a common practice in those times. The Township had been named by Italian immigrants in honor and memory of their homeland and one of its principal cities, Milano or Milan, with the emphasis on the last syllable. Thus evolved the unique situation of our town having four names at the same time, FARMERSVILLE, WOODARD MILLS, TOLANVILLE and MILAN. Needless to say, a considerable problem was encountered relative to the efficient delivery of mail. The matter was resolved, at least for postal purposes, on April 21, 1836, when the Postmaster General decreed that all mail to our village be directed to the post office of Milan. However, because of the natural human resistance to change, all names persisted until the Civil War period when the name of MILAN generally became accepted. MILAN was officially established as a Home-rule Village with a President and Council in the year 1885 and the name confusion was resolved once and for all. Our final change in status occurred in 1967, when a drive, spearheaded by our local Junior Chamber of Commerce, resulted in MILAN attaining City designation with a Mayor at the helm, rather than a President. the village is named for its founder, John L. Moore, who came from New York and settled here by the Saline River about 1830 and was appointed the first postmaster on Jan. 5, 1833. The post office was renamed York, after its township, from May 2, 1834, until it was closed on April 30, 1907, but the hamlet of Mooreville (in some records as Mooresville) remains. [Chapman; PO Archives]." Mooreville is located about three miles west of Milan. When the railroads decided to go through Milan instead of Mooreville, the community of Mooreville declined. Many of the buildings in Mooreville were then moved to Milan. Cyrus Everett built the first home in the area in 1831, the same year that Asa H. Reading and David Hardy built their water-powered saw mill; Ichabod S. Nelson became the first postmaster on May 7, 1834; the office was closed on Nov. 24, 1834, but was restored, with Mr. Nelson again its postmaster, on Jan. 21, 1835; with Asa H. Reading as postmaster, the office was renamed Readingville on May 2, 1835; with Mr. Nelson again the postmaster, the office was renamed Nelsonville on June 18, 1836; it was again renamed Oakville on Jan. 3, 1837, and remained so until it was closed permanently on Feb. 29, 1904; it was in the records of Washtenaw County as Readingville, the village being near the Monroe-Washtenaw County line [GSM 1838; Pageant of Monroe History; PO Archives]." Oakville is located about seven miles east of Milan. Oakville was named for the many Oak trees that grew in the area. The trees were cut down for use on the Plank Road that ran near Milan. Andrew Muir was the first [European] settler in the area, now Augusta Township; the village was founded by James Miller who came in 1829; the first post office in the township was opened at Paint Creek (q.v. ); the first post office named Stony Creek was opened on July 7, 1862, with Calvin H. Stone as its first postmaster, the office operating until July 15, 1905 [Chapman; Beakes; PO Archives]". Stony Creek is located north-east of Milan. There is an church with a cemetery behind it and an old granger hall still existing. the first post office in present Augusta Township was located at Wejinigan-sibi, or Paint Creek, which runs through the township; the office was opened on Jan. 15, 1837, with David Hardy as its first postmaster, but was transferred to Newcomb on Sept. 27, 1881 [Chapman; Beekes; PO Archives]." "Peter Cook, station agent for the Toledo and Ann Arbor Railroad here in York Township, in 1878, became its first postmaster on Jan. 10, 1879, the office operating until Jan. 31, 1914 [GSM 1879; PO Archives]." Urania was not a town or community. It was just a station along the Ann Arbor Railroad, at Willis Road. There was no store, no church, no school, and no town hall in Urania. "Urania" was just the name of a railroad station. The station got its name when Thomas Richards of Milan worked hard to bring the railroads to Milan. He was rewarded for his effort. He was given the chance to name a railroad station. He named the station at Willis Road after his late wife, Urania Blakeslee Richards. Urania Richards is laid to rest at the York Cemetery near her mother, Urania Blakeslee. Frank Whittaker opened a general store here about 1860 and the village was named for him; given a station on the Wabash Railroad in 1880 and a post office on Jan. 9, 1882, with William H. Bishop as its first postmaster [France Sikorski, PM; PO Archives]." 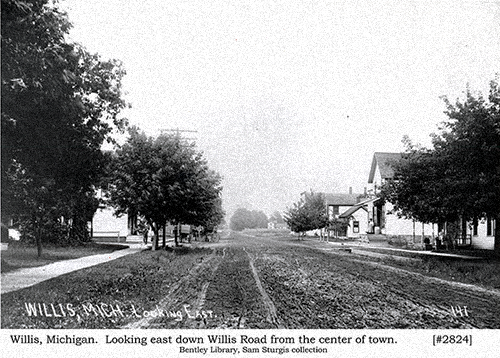 The town of Willis is located in Augusta Township, Washtenaw County. It did not exist before 1880, when the Grand Trunk Railroad (now Wabash) went through the area. The Railroad demanded that the area residents pay for a railroad station if they wanted a train stop there. Willis L. Potter was kind enough to donate land for the railroad station. This changed the area from open farmland to a town. He named the station and post office "Newcomb" after his wife's maiden name. The name "Newcomb" had to be abandoned immediately, because another town in Michigan had the same name. So the station was named "Willis." Nearby Paint Creek and Eaton Mills were not located along the railroad so they disappeared. A creamery was established on the north side of Willis Road between Bunton Road and the railroad. A pickle manufacturing place was established there, then a grocery store; it is still standing, used as a restaurant. The railroad station remained there until the mid 1960s when it was torn down. Photo 2824 from the Milan Area Historical Society collection shows Willis around 1880. Thanks to Warren Hale "Way Back When" March 21, 1984, and thanks to Ron Morey for information about the post office.